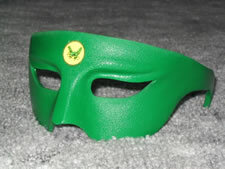 These beautifull Green Hornet Masks are screen accurate replicas of the ones worn by Van Williams in the famous 1966 tv series and come in all three versions just like on the show. Style 1, style 2, and style 3. Choose your favorite one or own all 3 to complete your collection. 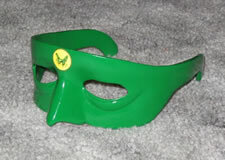 The masks are made of green urethane so there is no paint to scratch off. They are also very durable and can be worn or displayed proudly in your collection. All masks come in small, medium, or large. Medium is the actual size Van Williams wore and it fits an average adult size head. Note: These masks are not always available and will only be offered while supplies last.